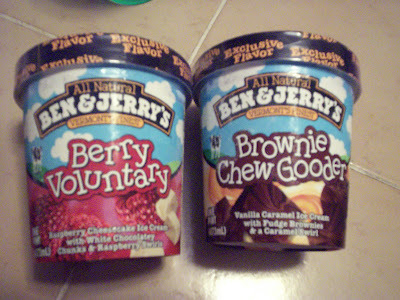 I came across these new Ben & Jerry's flavors while reading one of my favorite food sites , SERIOUS EATS . They did a little taste test and since Laura is a great B&J fan ( I'm team Haagen ) we decided to do our own . First step .....find them ! Laura drove and called every Target in our area to see if they had these new flavors in stock . They were no where to be seen . But lo & behold , a couple of the stores had empty rows with the new ice cream names tacked up in front . So they WERE coming . They just hadn't arrived yet . Laura and I would have to wait . We don't wait good . We called and drove and drove and called until this past Saturday night when we found them in the Dartmouth Target ( on sale 2/$5) . We put those babies on ice and drove them home ...fast ...it was really HOT . VERDICT: We both liked the BROWNIE CHEW GOODER a little better . Actually Laura liked it so much she had another later in the week ( but I wont tell that story ) . The vanilla - caramel ice cream was rich and creamy and the swirl of caramel gave it an extra buttery taste . But it was those brownies that sealed the deal . These were not the cakey brownie chunks in most brownie ice creams . These were like the brownie batter , before it is cooked . These brownie pieces are fudgey and gooey and fudgey and chewy and did I say fudgey ? Well they MADE this flavor for Laura and did the opposite for me . Because I don't care for ooey , gooey chocolate brownies ( I prefer a more cake-like one ) this was too much for me . 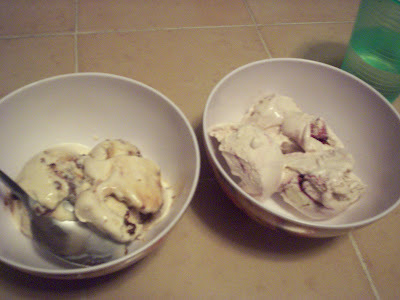 I actually liked the ice cream that was around the brownies and left a little pile of batter at the bottom of my dish . Laura just shook her head in disgust . Now the BERRY VOLUNTARY was a cheesecake ice cream that actually tasted like cheesecake instead of that funky ,trying-to-taste-like-cheesecake , flavor they usually end up tasting like . It was very rich and creamy and that may have been the problem . It was TOO thick , rich and cheesecakey almost to the point of being cloyingly sweet . I don't think you could eat a lot of this without getting sick . The best part was that tart raspberry swirl that you'd occasionally taste . It really helped to cut the sweetness and I'd wished there were more of it . It also had these rather large chunks of white chocolate ( that tasted like baking chocolate ) that were completely unnecessary .All in all not a favorite flavor for either of us . Although both of these new flavors will have their fans , I don't think they'll replace any of the old favorites . It's always interesting to see how much more STUFF B&J's can think up to add to their flavor bases . As for me , I'd like less stuff and more fluff in my B&J's . Plain flavors can be good too. Ask Haagen-Dazs .